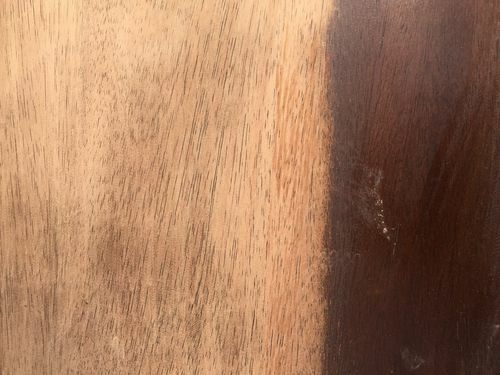 All Replies on What type of wood is this? Close up photos would help. Thanks for the fast replies! Looking it up on the Internet, it sure looks like Alder. Here’s a closeup. It’s more than likely Luan, which is just a generic name for one of dozens of different types of woods in the Shorea genus. In a nutshell….It’s ‘fake’ Mahogany. I agree with Tony. Any alder answer should be blocked as its not funny,unhelpful and confusing for new members. Let’s not get uptight about it, geez!! Have a little fun already! Oh, that made me feel foolish. But I’m a big girl. I’m over it. I really just want to know if the type of wood makes this a more or less expensive piece of furniture. Only alder will make it more expensive. If it’s not alder it’s trash. You should probably burn it. Stains come in a wide variety of colors and can also be mixed to achieve a custom color, if desired. 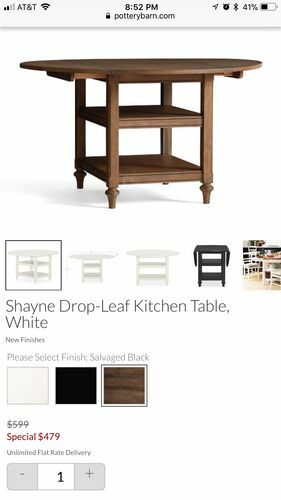 Ordinarily, one would use the stain on a “test piece” in an effort to decide which stain best suited the final piece but it seems as if you don’t have that luxury. 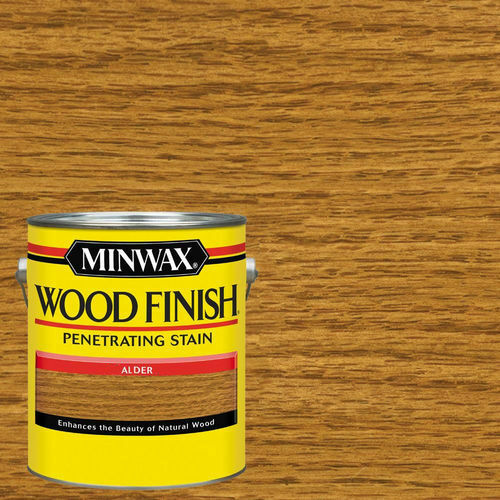 Be aware also, that if the top is just a veneer it may not take much sanding during your refinishing to work your way right through to the substrate. Go easy. As for the “type” of wood? I’ve been duped myself by the Alder-Boys and have opted to throw in with them, mostly because I rarely have any clue when it come to wood species identification and because I think they’re fun. Alder is always my first answer to any “what kind” question, but resident Tony_S is has much more expertise than most folks you’ll find offering opinions. 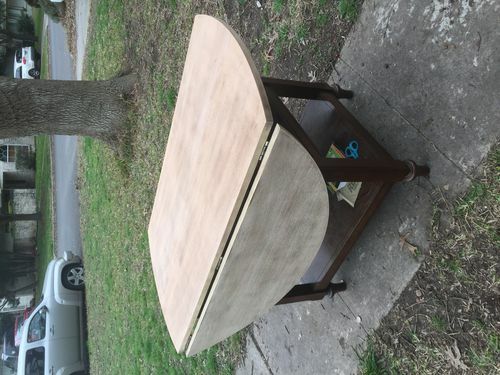 Ripper, what stain could I use to give my maple table that alder look? Probably a less expensive piece, but that would only be a subjective guess without seeing and knowing more about it. I’ve seen and done some pretty expensive work in Alder…..I think the stuff is garbage personally. TonyS! That hurt on so many levels! Alder…..I think the stuff is garbage personally. Here’s my progress. I have figured out that the piece was originally a Pottery Barn piece. Does that clue anyone in on what type of wood they typically use? According to the website is states: “Finely crafted of hardwood and veneers over MDF.” I think Tony_S has it right. Some kind of fake Mahogany. LOL! Of course Tony is right, something all you non Canadians need to know, Calgary considers itself superior to even “The Center of the Universe Toronto” ! Something to do with Edmonton becoming the capital of Alberta after a dirty Liberal trick many many years ago? This worn out joke is not the least bit funny when it confuses a new member who hasn’t encountered the idiotic joke in the past. Let s not get uptight about it, geez!! Have a little fun already! can you get a picture of the straight edges of the drop leafs? I believe that it is Indosesian rubberwood. I think you may be correct about Calgary. I was visiting in Canmore (sp?) years ago and my host told me that people in Vancouver think they live in the greatest city on earth, but Calgarians know they do.